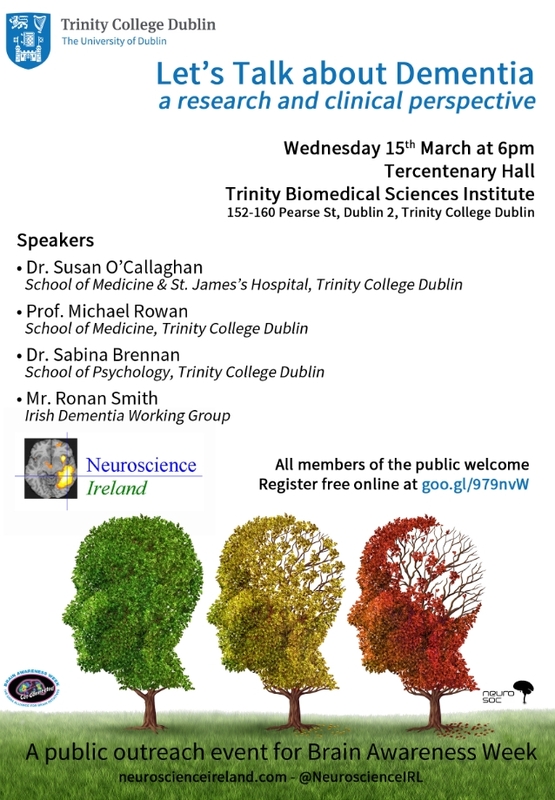 Neuroscience Ireland invited all to a free public lecture series at Trinity College Dublin to mark Brain Awareness Week 2017. 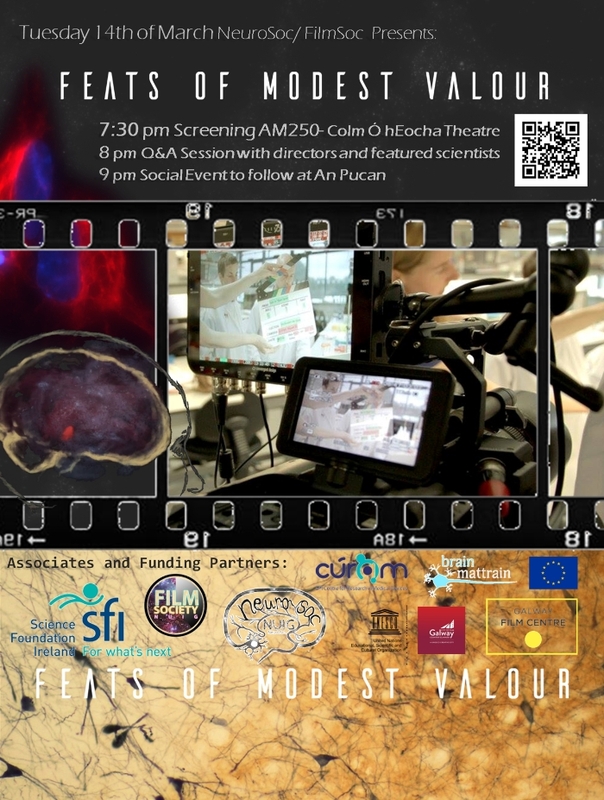 The Galway Neuroscience Centre, in association with NUI Galway’s NeuroSoc and FilmSoc, hosted a free public screening of the SFI-funded Parkinson’s documentary “Feats of Modest Valour” in NUI Galway to mark Brain Awareness Week 2017. The Galway Neuroscience Centre held the “My Amazing Brain” in the Aula Maxima at NUI Galway to mark Brain Awareness Week 2017. Members of the public and children from local schools will had the opportunity to visit the exhibit to learn more about how the brain and nervous system work. The exhibit consisted of interactive displays where visitors learned more about the nervous system in a hands-on way. For example, there were various puzzles and tests of hand-eye coordination, visual perception, left/right handedness, creativity and many others. Approximately 180 million Europeans are thought to suffer from a brain disorder, at a total cost of almost €800 billion per annum and visitors had the chance to learn more about the brain and related disorders through a series of large information posters prepared by the staff and postgraduate students of NUI Galway Neuroscience Centre. The posters covered a variety of illnesses including: Epilepsy, Parkinson’s disease, Pain, Anxiety, Depression, Schizophrenia, Alzheimer’s Disease, Stroke, Brain Injury and Spinal Cord Injury. 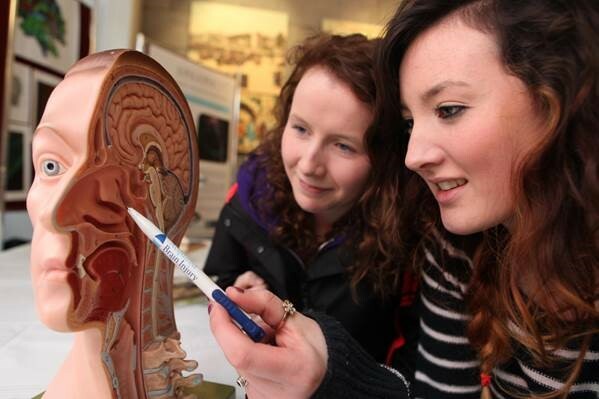 In order to mark International Brain Awareness Week, staff and students of NUI Galway’s Neuroscience Centre held a public information exhibit entitled “My Amazing Brain” from 15-16th March in the Aula Maxima, NUI Galway. 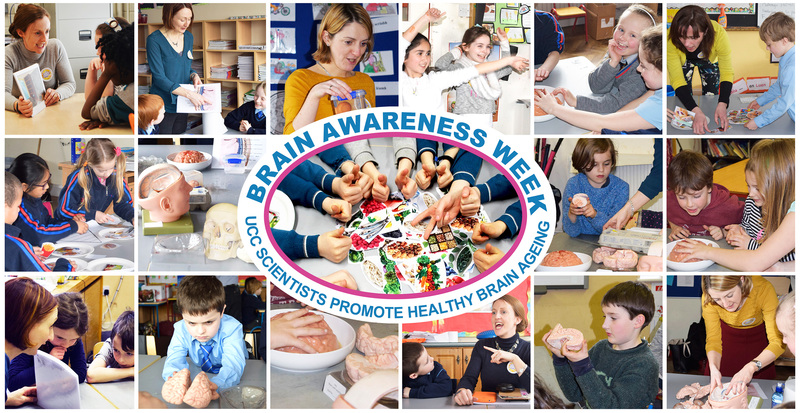 During Brain Awareness Week, a group of UCC neuroscientists engaged children from five local primary schools (Glounthaune, Greenmount, Glasheen Girls, Glasheen Boys and St Finbarres) in fun activities to promote the importance of brain health during childhood. With the cooperation and enthusiasm of teachers in the participating classes, children eagerly joined in the activities which focused on positive lifestyle choices for brain health. They carried out brain safety ‘egg drop’ and ‘jelly brain’ experiments, prepared healthy ‘brain food plates’, played memory games, danced and exercised to ‘activate their neurons’, enjoyed a ‘brain food’ blueberry snack and relaxed by having a ‘brain break’. Information sessions in each of the schools were also held for parents to emphasise the importance of early intervention in order to prevent cognitive and mental health issues in later years. Lifestyle habits that affect the developing brain including diet, exercise, sleep, mental stimulation, stress resilience, social interaction and safety were discussed. The feedback from teachers and parents was overwhelmingly positive and schools have suggested that it would be extremely beneficial if more children could be targeted. The team members of UCC’s Healthy Brain Aging initiative for children are Caitriona Long-Smith, Cara Hueston, Shane Hegarty, Aideen Sullivan and Yvonne Nolan from the Department of Anatomy and Neuroscience, and Janas Harrington from the Department of Epidemiology and Public Health. 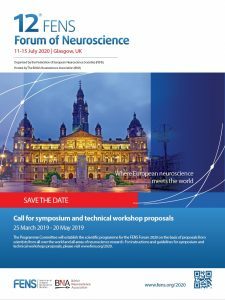 Funding was provided by Federation of European Neuroscience in partnership with the DANA Foundation. Blueberry snacks were sponsored by Supervalu. Brain Awareness Week is the global campaign to increase public awareness of the progress and benefits of brain research (http://www.dana.org/BAW/). Our event involved a one-day seminar that provided an opportunity for members of the general public of Cork city to engage with professionals involved in neuroscience research, mental health services and charities, who together support patients and families affected by mental illness, brain tumours, brain injury and dementia. The meeting provided a platform where attendees learned about a wide range of topics discussed in a friendly atmosphere. Amongst the broad range of brain related themes discussed, were issues such as “De-stigmatising mental illness”, “Cognitive and emotional Consequences of head injury”, “Biomarkers for stress resilience”, “Support provided by charities”, “Brain health in ageing”, “Dementia care and treatments” and “Supporting brain research in Ireland”. 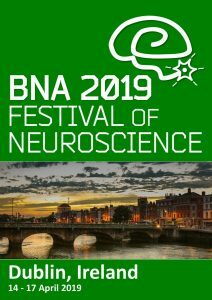 Neuroscience Ireland is keen to communicate the importance of neuroscience research to the general public. 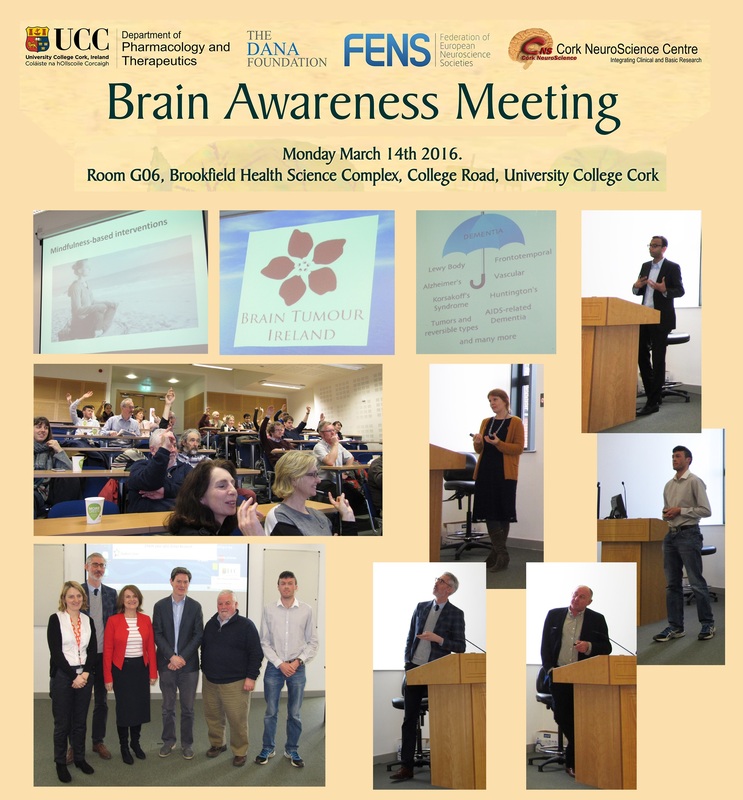 Below is a report from an outreach event organised in part by Neuroscience Ireland members in Galway during Brain Awareness Week 2014. 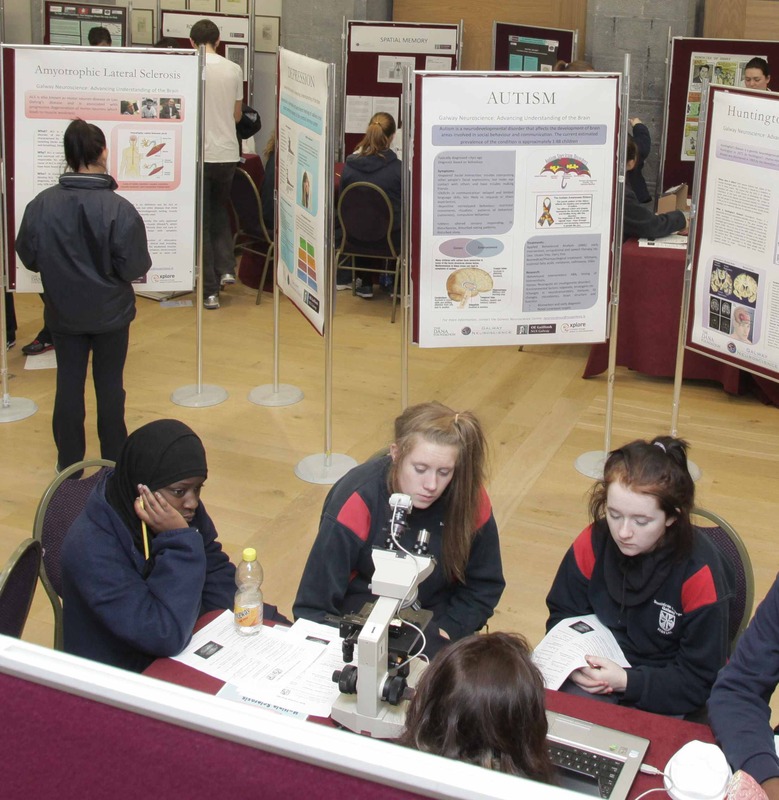 As part of the international ‘Brain Awareness Week’ event, staff and students of NUI Galway’s Neuroscience Centre organised a major public information exhibit in the Aula Maxima, Quadrangle, NUI Galway on Tuesday 11th March and Wednesday 12th March. Members of the public and children from local schools visited the exhibit to learn more about how the brain and nervous system work. The exhibit consisted of interactive displays where visitors could learn more about the nervous system in a hands-on way. For example, there were various puzzles and tests of hand-eye coordination, visual perception, left/right handedness, creativity and many others. There was also lots of general information about the brain and visitors had the opportunity to learn more about brain disorders, via a series of large information posters prepared by the staff and postgraduate students of NUI Galway Neuroscience Centre. Approximately 180 million Europeans are thought to suffer from a brain disorder, at a total cost of almost €800 billion per annum. The posters covered a variety of illnesses including: Epilepsy, Parkinson’s disease, Pain, Anxiety, Depression, Schizophrenia, Alzheimer’s disease, Stroke, Brain injury and Spinal cord injury. Information leaflets obtained from brain-related charities and organizations were on display and available for the public to take away, such as the DANA Foundation, MS Ireland, Alzheimer’s Society of Ireland, Parkinson’s Association of Ireland, Aware (relating to depression), Chronic Pain Ireland, Shine (relating to mental health, Acquired Brain Injury Ireland, Brainwave (the Irish Epilepsy Association). Microscopes were available to view brain cells and brain tissue sections for those interested in seeing what a brain cell and brain tissue really looks like. Additional features included plastic models of the nervous system, and even Play-Doh and colouring books for the very young!